Our Gospa od Skrpjela translated as the Lady of the Rock is an exquisite anomaly which grew, perhaps, out of remorse for the heinous act perpetrated on St George. Around a small crag, skripio in Dalmatian dialect, local people started to built another island. It began with the hulls of scuttled ships and was reinforced by stones carried boatload after boatload to form a seat for a votive chapel which in 1630 they dedicated to the intercession of the mother of Christ. By 1725 the original chapel of the Gospa od Skrpjela had been enlarged by the addition of a sanctuary with a distinctive octagonal dome. In the small square in front of the church they arranged a so-called ” place of reconciliation”, the idea being that quarreling parties in local disputes might work out fair solutions in the shade of the church and so avoid the Venetian courts. The stone benches are a reminder of the personal and community dramas that must have been enacted here. The interior of the Gospa od Skrpjela church forms a prodigious homage to the work of Tripo Kokolja (1661-1713) a self-taught local artist, no less than 68 of whose paintings cover the walls and ceiling, portraying Old and New Testaments events. Above the altar of white Carrara marble hangs an icon of the Madonna and child by Lovro Marinov Dobricevic of Kotor (15th century). On each side of the altar are marble figures : St John the Evangelist on the left and St Roch on the right, by Venetian sculptor Francesco Gai (1783). The painting of St Roch to the right of the altar is attributed to Tiepolo and the four large canvases which decorate the dome are from 17-th century school of Genoa. At the back of the church the ‘keeper’s lodge’ holds a small museum : two floors devoted to the turbulent history of Perast, a vivid assembly of wonderful paintings of stormy seas, dramatic exploits and heroic struggles; pieces of Greek and Roman amphora from the seabed : pottery shards and stone weapons from 3500 BC discovered in the Spila cave above Perast; an early hand-powered iron screw with two transmissions that served to propel the St George Monastery boat; and best of all a delicate, embroidered icon, the labor of one Jacinta Kunic, in which she sewed her own golden hair on the heads of Madonna and child. It took here 20 years to complete, by which time those hairs were grey. An adjoining room in the Gospa od Skrpjela holds a veritable antique shop of artifacts dedicated over the centuries in gratitude for delivery from danger; everything from sea-rusted-pirate-proof locks to latter-day protection – twisted car bumpers. Every year at dusk on July 22 the rite of ‘scattering stones’ is re-enacted in a colourful procession of brightly decorated boats tied together and accompanied by music and folk-singing. A second ritual in which, in the absence of Ottoman invaders, a rooster is set adrift and subsequently dispatched in a great volley of fire, is no longer encouraged. Whether by chance or design the completed island has taken the outline of a galleon. 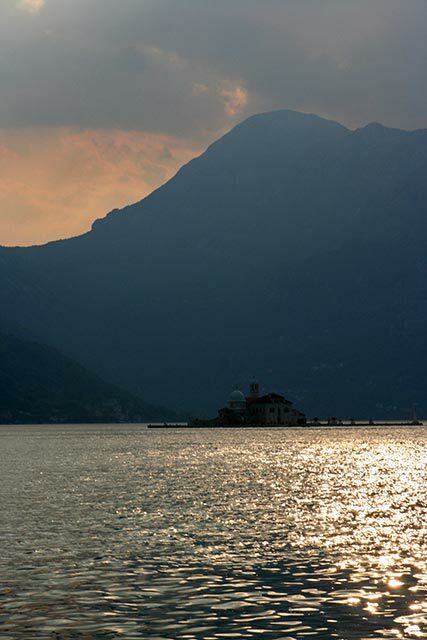 A visit here is pause for thought that for all the gorgeous churches on the mainland endowed by rich merchants and ship owners, the Gospa od Skrpjela represents a distillation of the spiritual conscience of the ordinary seaman of Perast. 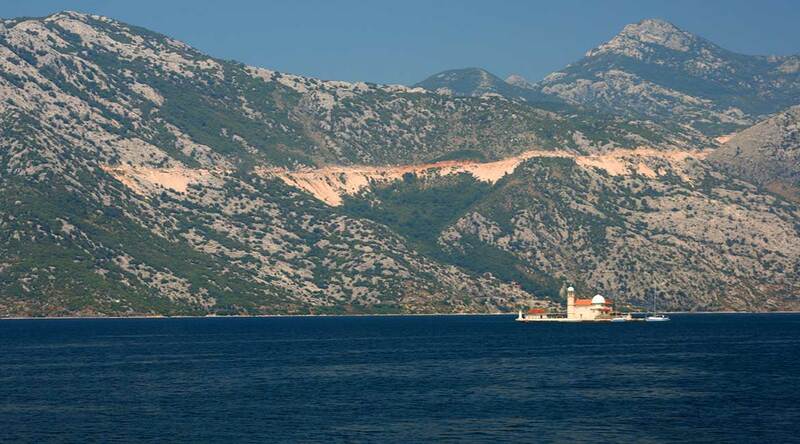 The islands in the summertime can be visited from almost every town in the Boka Kotorska by boat. Cost are varying depending on the length of the trip. 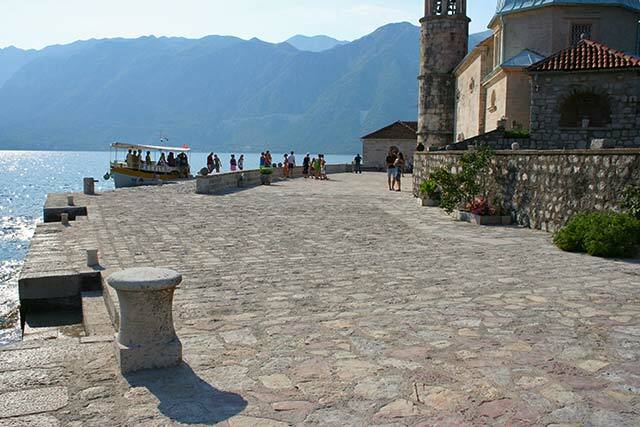 The cheapest can be found from Perast and will cost around 5 euro a person. Keep in mind the Gospa od Skrpjela is a sacred place so propitiate behavior must be used like in regular churches. But make sure you wear a shirt and don’t go bare chested because you will not be allowed on the islands. With its beautiful location just off the coast of Perast there is sufficient accommodation available in the vicinity of the island. 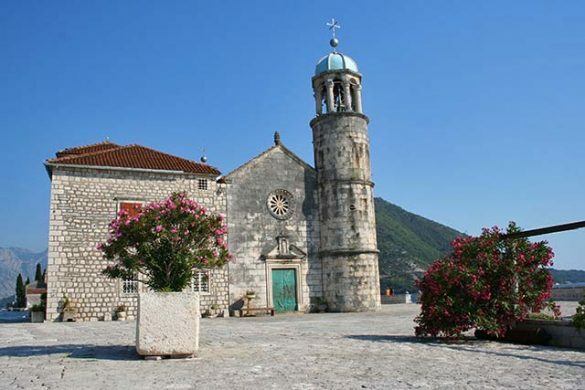 Accommodation in Perast is entirely in keeping with the historic appearance of the place, the island and the former glory that once prevailed. Its small size and little available space along the narrow coastal strip and the fact that it is Unesco World Heritage has ensured that accommodation is found almost exclusively in the historic houses or monumental buildings. The former villas of the once wealthier seafarers families who are the most striking in this. All have retained their beautiful baroque architecture using a lot of stone. From some, the crossing to the island is easy to arrange. Conte Hotel & Restaurant – Hotel Conte is located in the former House of Culture, on the waterfront, on the central square in Perast and is a listed listed building. The restaurant specializes in local and Mediterranean cuisine and uses local ingredients to prepare meals. 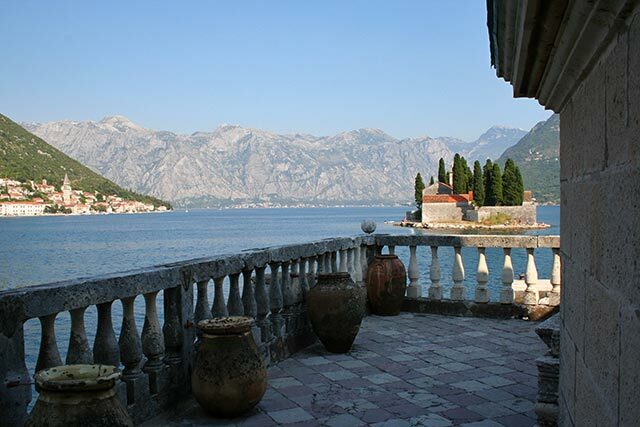 The hotel offers elegantly furnished suites and rooms with a beautiful view over the Perast islands. The local bus station is next to the property and the supermarket is just 50 meters from the Conte Hotel. Facilities : Restaurant (à la carte), Free parking, Free Wi-Fi Internet Access Included, Terrace, Garden, Mini Bar, Bar, Airport Shuttle, Laundry (surcharge), Ironing Service (surcharge), Luggage Storage, Tour Desk, Express Check-In / Check-Out.